We start with Reece Sheersmith’s character, Rassmussen telling the camera of something happening on a laboratory on a space station. Rescuers come to his aid who also find the Doctor and Clara on board. A monster tries to attack them but they escape to a room where sleep pods called Morpheus are used to help rejuvenate the crew that keeps people awake more than they should be for sleep is essential to the human race. 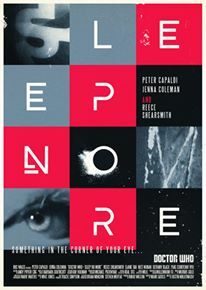 The Doctor thinks that sleep dust is the very thing that is attacking them, somehow created by the Morpheus machines which could spell the end for the entire human race. The on-board computer does not seem right but is she somehow responsible? One by one they are taken by the monsters/Sandmen, each getting separated. The Doctor realises that the soldiers do not have helmet camera’s and works out things from there and must stop it before it is too late. Before humanity is wiped out. First up, no main titles in this episode, such an iconic part of Doctor Who. The general idea is not original, from the shaky camera work, individual viewpoint and otherwise, to rampaging monsters hunting them down one by one. In fact I read a Doctor Who book called Ten Little Aliens by Stephen Cole earlier this year where the storyline has a very similar theme, including the use of the helmet cameras. There are lots of shots where the Doctor talks to the roving camera which some would find annoying. I though didn’t mind that as it gave Capaldi a chance to interact with the audience. The Sandmen were good creations, nightmarish in their design but the who idea felt tired which is ironic considering what it was meant to be about. This is not the first episode about sleep and I am sure it will not be the last. The whole episode ran like an old episode of Hammer House of Horror but set in space. The last scene was a bit much for kids I thought but was a nice twist. For me though this was not the strongest episode in this series even with two of the League of Gentlemen involved in it (Mark Gatiss writing, Reece Shearsmith acting) which is a shame for they always work well together. This though did not work as well as it should have done. I felt it was missing something but it was okay for what it was, just not what it could have been. Hopefully next weeks episode will be better which looks like it has used a set from Harry Potter? We shall see won’t we.